How to Become a Forensic Scientist in Washington? How much does a Forensic Scientist make in Washington? There are currently around 600 forensic science technicians working in Washington, with the highest concentration (210) being in the Seattle-Bellevue-Everett, WA area, according to May 2017 data from the US Bureau of Labor Statistics. With crimes being committed every few minutes in the state, this number is expected to grow in the coming years. The job of a forensic scientist in Washington is to collect evidence from the crime scene, including fingerprints, bone samples or blood samples to analyze the crime in detail. The highly technical nature of this job calls for very specialized education and training. Luckily for aspiring forensic scientists in Washington, education, training and job opportunities are all available in the state. If you need information on how to become a forensic scientist in Washington, the following guidelines would be of great use to you. Bear in mind that the exact requirements may vary from employer to employer, so conduct a thorough research before applying. Washington has four job classifications for forensic scientists: Forensic Scientist I, II, III and IV. The following list of requirements is applicable to all four classifications. Note: The following steps are to be taken as general guidelines. For more detailed steps, you will need to visit the websites of the organizations you are applying to work for. Requirements and application procedures vary according to the employer and the position. 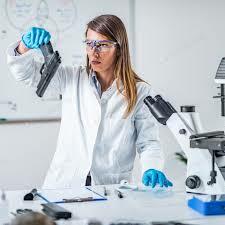 Most entry-level jobs in the forensic science industry would require applicants to possess at least a 4-year long bachelor’s degree in criminal justice or natural science such as chemistry or biology. You may even have the option of specializing in various areas of study such as pathology, DNA or toxicology. Depending on your employer, you may be required to fulfill some training requirements. For instance, many forensic scientists who work with police departments may be sworn police officers themselves. For this, they would need to meet all the training requirements associated with becoming a police officer. According to the US Bureau of Labor Statistics, “Many of those who seek to become forensic science technicians will have an undergraduate degree in the natural sciences and a master’s degree in forensic science.” For this reason, you might want to consider getting a higher education degree in forensic science. Even though it is not a requirement for entry level jobs, it is certainly recommended, since the employment in this sector is highly competitive. You may find multiple opportunities for jobs at the county, state and federal levels. The Washington State Patrol Forensic Laboratory Services might be a good place to look for job opportunities. Other places you can find employment include various analytical, diagnostic or medical labs. On-the-job training options are also applicable in most forensic science jobs. Newly hired investigators would be expected to work under experienced professionals while they learn the proper procedures and methods for collecting and recording evidence. The length of the training period depends on the area of forensic science you are working in, but it is typically less than a year. In some cases, Forensic Scientists may also be needed to pass a proficiency exam before they are cleared to work on cases independently. If you want a professional credential, you have multiple options. The American College of Forensic Examiners is one such option. It offers the Registered Investigator credential. Similarly, the American Board of Criminalistics is also an option for those looking to get certified. It offers the Diplomate of ABC credential and the Fellow of ABC credential. The state of Washington has a bright career outlook for forensic scientists. Find out how to become a forensic scientist in Washington, right here. The career outlook for forensic scientist technicians in Washington looks quite bright, with a 10% positive change expected in job openings in the years up till 2026, according to O*NET OnLine. State and local governments are expected to hire more professionals in this field as the load of criminal and fraud cases increases. In addition to that, the increasing usefulness of the information provided by forensic scientists is expected to help keep their demand high in the job market. However, with only 60 jobs being added in the years up till 2026, the competition is expected to be very strong. Candidates who possess higher education degrees in forensic science might have the best opportunities available to them.